of Surrender, December 9th at 8 a.m."
The fighting of World War I was not confined to Europe. Simultaneously, a major war was being waged in the Middle East. 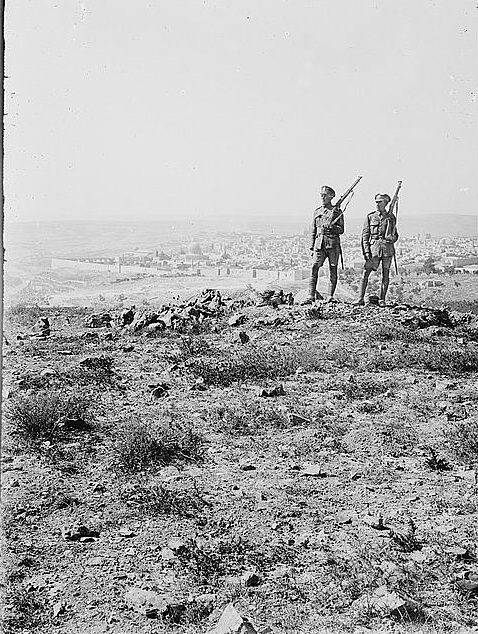 Fighting in the Sinai and Palestine, beginning in January 1915 and lasting until October 1918, was vicious and took a heavy toll on both sides. 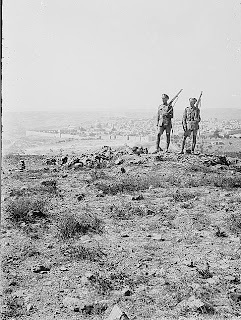 British Empire troops fought the Ottoman army supported by German and Austrian officers and troops from the Suez Canal, through the Sinai, Gaza, Beer Sheva, Jericho and from Jaffa up the steep road to the outskirts of Jerusalem. See earlier photo essay on the critical battle of Nebi Samuel. 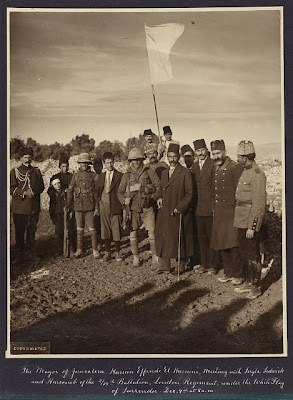 After capturing Jerusalem, the British Army pressed the Turkish army northward all the way to Damascus. 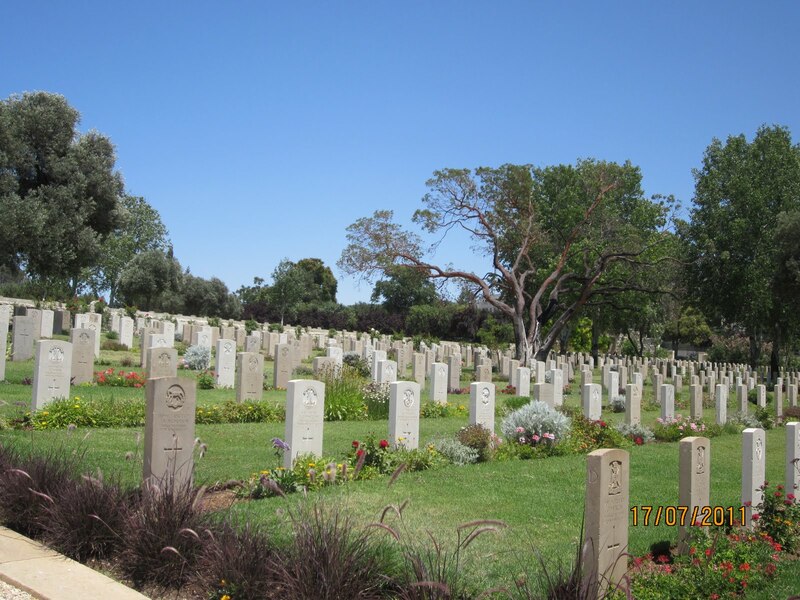 Visitors to Jerusalem should pause for a few seconds when they pass the 2,500 graves at the British cemetery on Mt. 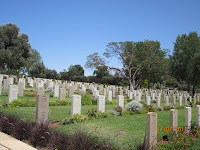 Scopus which include the graves of several dozen Jewish soldiers from the British army. 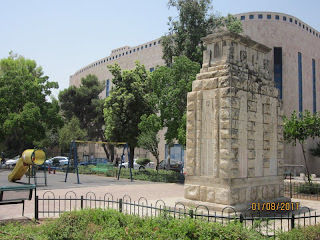 But, imagine the surprise of two British scouts, Sergeants James Sedgewick and Frederick Hurcomb on the morning of December 9, 1917 when they were met by a Jerusalem delegation of dignitaries on the western approaches of Jerusalem. Walking beneath a white flag of surrender were the mayor of Jerusalem, Hussein el Husseini (with the walking stick and cigarette), the chief of the Jerusalem police (at the far left, resplendent in his parade uniform), several police officers, and a handful of hangers-on. They bore a letter of surrender from the Ottoman Governor Izzat Pasha. El Husseini also brought a young photographer from the American Colony photographers, Lewis Larsson. ﻿﻿﻿﻿Sergeants Sedgewick and Hurcomb refused to accept the letter, preferring that senior officers take the responsibility. Eventually, the surrender was received by Brigadier-General C.F. Watson, (who was delayed when his car got stuck in the mud) but, according to Palestinian Arab publisher Mohamed Ali Eltaher (1896-1974), the British brass were upset that a photograph of the surrender to sergeants existed. "When Commander in Chief General John Shea learned that young Larsson had captured on film the real moment of surrender, and not the moment when he stood on the steps of David’s Tower to proclaim martial law, he demanded that Larsson destroy the negatives and all copies of the picture. He sent an officer to see that his order was executed," Eltaher wrote. 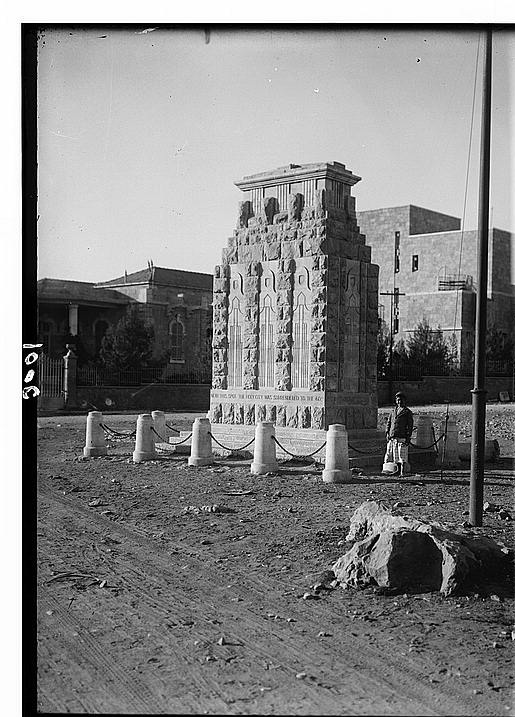 But copies of the photograph survived, and the picture became one of the icons of the modern history of the Middle East. You forget to mention that this is one of the American Colony's most important photos not only because one of its photographers took it. The white "flag of surrender" that symbolized the Ottoman handover of power in Jerusalem to the British was a bed sheet borrowed from the American Colony hotel. The photographer who took the famous picture of the surrender of Jerusalem on the 9th of December 1917 was none other than my grandfather, Lewis Larsson. The first time I saw that photograph was in my childhood home when my grandfather showed it to me. I had thought though that the makeshift flag was indeed a sheet from the nearby hospital.